Say "hello baby" with Pearhead's modern and trendy baby memory book keepsake. This modern, black and white baby book includes 50 fill-in photo journal pages to record all of baby's moments from birth to the first days of school. Display baby's 4"x5" sonogram photo on the front cover of this stylish baby book. 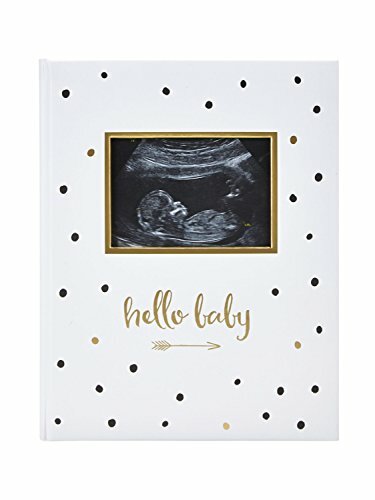 White, black, and gold foil colors decorate the front of this baby book with "hello baby" and a modern arrow design stamped in gold foil. The inside pages of the baby memory book include space for photos, artwork, birthday memories, school keepsakes, and more. This keepsake baby book also includes an area to fill in baby's family tree and information about baby's parents. Place your favorite photos of baby, mommy, daddy, and more throughout the first few years of their life inside this guided journal.Pearhead's baby book is the perfect gift for any baby shower or a must have for your baby gift registry. Give this special baby memory book as a baptism gift or gift for baby's christening. Any parent is sure to love and cherish this special keepsake book. Product dimensions: 8.88" W x 11.25" H x .56" D; Photo insert: 4" x 5". At Pearhead, we aim to create genuine, quality products to celebrate your special moments in life. We are a family of designers, marketers, and trendsetters bringing products to life that will bring a smile to your face. From concept and design to production and customer service, the Pearhead team works together seamlessly every step of the way. Whether your baby is celebrating their first year of life, you are announcing your pregnancy, or your pup is celebrating his first holiday season, Pearhead is here to share your moments in style. This babybook is decorated in black and gold polka dot designs. "Hello baby" and a gold arrow is foil stamped on the front of the book, adding a modern touch. This keepsake book also includes gold lined pages, adding an extra too-cute touch! Don't forget to add this adorable book to your baby registry. It's also a great baby shower gift to give anyone expecting a boy or a girl! A fun first Mother's Day gift for mom!